It has come to our attention that several families have been misinformed regarding the Church's fasting rules, especially the rules for children. Here we will list the general fasting rules for both children and adults. Those with special circumstances, (such as illness, pregnancy or nursing) should speak with the priest before relaxing these rules. In general, all people, (children included), should start following the Church's fasting rules-- no meat or dairy on Wednesdays or Fridays and during periods of fast-- from age three. Once they reach age 7, they need to start coming to the priest for regular Holy Confession before they can commune. In order to partake of Holy Communion each week, one must follow the fasting schedule for that week. Parents of small children are expected to fast on their children's behalf, at least on Wednesdays and Fridays and any other prescribed fasting days for that week. PLEASE NOTE: Despite what has somehow transformed into a lackadaisical Serbian "custom," according to the Serbian Typicon: In general, FISH IS NOT ALLOWED ON FASTING DAYS, INCLUDING REGULAR WEDNESDAYS AND FRIDAYS. There are some feast days where this rule is relaxed. Please consult our online calendar for specifics. 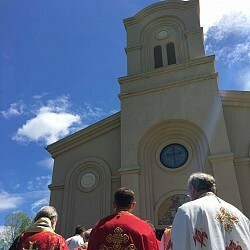 Those who fast on the prescribed days of the calendar, including every Wednesday and Friday, (except in the weeks following the Nativity of Our Lord, Pascha, and Pentecost), can partake each time they attend the Divine Liturgy, provided that they prepare themselves each time with prayer and repentance. The exception to this rule is during Bright Week, when the entire week of Sunday to Friday is liturgically considered to be one day. Therefore, NO FASTING is required on these days and the prayer rule is changed to singing the Hours of Pascha, instead of the normal pentitary prayers..
Everyone who is fasting for Holy Communion needs to be sure not to eat or drink anything, or smoke until AFTER the liturgy is completed. Children under age 3 may eat or drink something light before the service, but certainly no food or drinks should be brought inside the church. The prayer rules for before and after receiving the Holy Gifts can be found in the Jordanville Prayer Book available at our bookstore, or you can download them here: Preparatory Prayers for Holy Communion These prayers are neccesary to be recited each time one communes. Women and girls are expected to approach the chalice with proper dress---no pants or sleeveless shirts--- with their heads covered. This includes children. During their monthly cycles, women are not to partake of Holy Communion. Also, please do not approach the Holy Chalice or any of the holy icons with lipstick or lip balms on. The lipstick colors and oils stain these precious pieces making them quite difficult to clean. They also often come off on the lips of the next person who venerates that icon. It is of grave importance that we follow these rules and approach the Holy Mysteries with fear, having done all we can to prepare ourselves both physically and spiritually. We must not be at odds with anyone; rather we must forgive our brothers and sisters and ask them for their forgiveness if we have grieved them. Holy Communion is a beautiful Gift from God which enables us to literally become "one in flesh" with Him, as our bodies absorb the transubstantiated bread and wine. Scientifically it has been proven that when you don't eat for eight hours or so, your mouth immediately absorbs and binds with the first thing you put into it. We should all try to take Holy Communion as often as possible, using these rules and guidelines as tools to draw us closer to God and perfect our obedience to and love for Him.